Paul Cook is adamant the answers to Wigan Athletic’s current problems will come from within the camp. 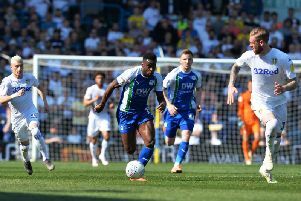 Latics are doing it tough at the moment, with Cook still waiting to learn the extent of the injuries sustained by Gary Roberts and Nick Powell at Sheffield United last weekend. Cook is already without Gavin Massey and Michael Jacobs until the New Year, with Will Grigg only having an outside chance of returning to the fold before the festive period. But rather than look elsewhere for reinforcements – clubs are able to sign free agents outside the transfer window – Cook says he’s happy to run with what he’s got until January. “Reports of us wanting to sign players would be far from the truth,” he told the Wigan Post. “I’m delighted with our squad as it stands. We’re in the midst of a spell that’s been as tough as we’ve had since I’ve been here. “But I don’t seek answers from other places – I seek it from within. Cook had been running the rule over former England centre-back Steven Caulker, who is without a club after leaving Scottish outfit Dundee over the summer. It’s understood the 26-year-old is no longer training with Latics as he assesses his options, although Cook didn’t close the door totally. “He’s a possibility, yes, but I am happy with the players in that department,” added the Latics boss. Cook will at least be able to welcome back Darron Gibson for Sunday’s visit of Leeds, with the midfielder having completed a three-match ban.